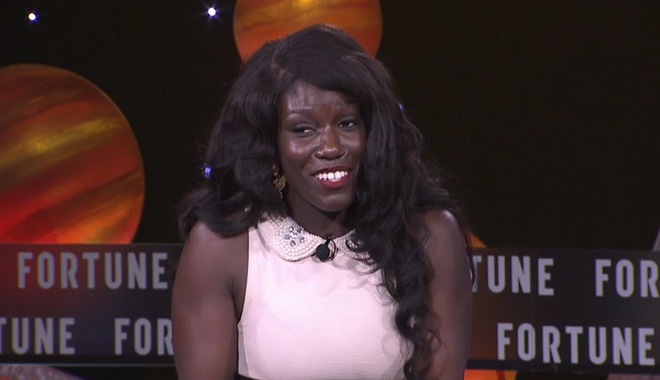 Bozoma Saint John, global marketing executive for Apple Music and iTunes, took part in a brief interview as part of Fortune's Most Powerful Women Next Gen conference on Tuesday, offering those in attendance a lesson in self-confidence she learned as a teenager. Speaking to Fortune, Saint John recalled how at the age of about 13 she emigrated from Ghana to Colorado Springs, Colo., with her parents and three younger sisters. The life changing experience forced her to embrace who she was, a realization that helped pave a road for success, first at Pepsi, then Beats and now at Apple. Saint John said her stature (she was about the same height at 13 as she is now) and skin color effectively deflated any attempt to fit in among her peers. This ultimately turned out to be a blessing, however. "I couldn't hide, there wasn't a choice to do that," Saint John said. "So the choice was do you try to do what everybody else was doing? I couldn't be blond, I couldn't be white. [...] I just couldn't be anything else, and so it meant that I had to become just all of everything that I have." The lesson was an important one for Saint John, who bears her diverse background as a virtue, not a hinderance. "Because at 13, I learned what it meant to walk into a room and not care when everybody else turned around and looked at you. And here I am," she said. The message echoes an Apple initiative to celebrate diversity among its employees by creating an all-inclusive workplace. According to a recent EEO-1 filing, the company has a long way to go for its upper echelons reach an equilibrium between white males and underrepresented minorities —at least by government measures —but progress is being made. Known to friends as "Boz," Saint John became part of the Apple team when the company purchased Beats Music in 2014. Initially a behind-the-scenes operator, Saint John recently came to the fore thanks to a memorable onstage presentation at this year's Worldwide Developers Conference in June. The executive has since become a corporate ambassador of sorts for Apple Music, and even found herself in an Apple Music ad alongside SVP of Internet Software and Services Eddy Cue, Jimmy Iovine and James Corden.